My Hydrangea isn’t Flowering – HELP?! A question we get asked a lot is: “Why aren’t my hydrangeas blooming?” Kathy, the host of Georgina Blooms, also gets asked this question a lot – so she asked if we’d do a show with her to teach everyone how easy it is to get your hydrangeas to bloom! There could be many reasons such as, not enough light, too much light, not enough fertilizer, too much fertilizer, not the right fertilizer, BUT quite often it comes down to PRUNING!! – an easy fix! How and when to prune hydrangeas. Each cultivar is slightly different so, here it is, all in one spot, easy to follow!! These hydrangeas form their flowers buds in the late spring to early summer. Prune in late fall, winter or early spring. 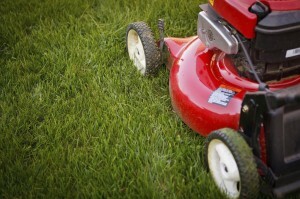 They respond well to being cut back to about 4″ – 10″ above the ground. Big Leaf Hydrangeas typically do not require too much pruning. If you would like a tighter plant or keep it a shorter size, keep reading! The flower buds form later in the summer for next year’s blooms. The best time to prune it is right after it blooms, from mid-July to mid-August – no later – this gives it time to set bud for next year before the winter hits. Selectively prune out any dead stems, or old non-flower producing stems in the spring after it has leafed out. They bloom on new wood and are best pruned in late fall. Some choose to prune in the early spring so they enjoy the dried blooms over the winter – just make sure you get out there early!! They are very tolerant of hard pruning, in fact cutting the plant back from 1/2 to 1/3 of it’s size will result in larger flowers. Some selections, such as Limelight, make an beautiful hedge. This entry was posted in Shrubs and tagged blooms, flowers, how to, hydrangeas, proven winners, pruning, shrubs on August 4, 2018 by Online Graphics. There are many different varieties of hedge but the theory remains the same. Establish your shapes and contours early on in the hedges development and maintain these same designs through its lifetime. When setting up your hedge there are a few things to keep in mind. Its better to take too little off when cutting as you can’t put it back on and cutting too deeply and gouging into the wood will create undesirable brown spots. It is better to round out the top of your hedge then to make it perfectly flat as this will help it shed snow avoiding potential shearing and broken branches. It is imperative that the bottom of the hedge is thicker in width than the top and tapers upwards, never the other way. 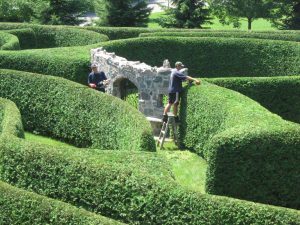 While your hedge can be shaped in very artistic ways it is still a living thing and has requirements, especially in terms of sunlight. 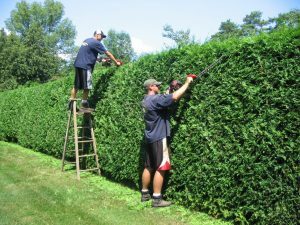 A well shaped hedge allows sunlight to hit the entirety of its surface as such tapering the hedge top down is very important. The rule of thumb is to cut twice. Cut the hedge in a way that takes off the most vigorous growth then take a rake and gently bang out the cut pieces, going up and down the hedge across its entire length. These bits will brown up in time and make your hedge look unkempt and disorderly. Following the first cut you will see a notable difference in how tight the hedge looks. 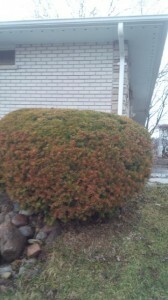 To help picture what we mean by tightness consider it like given your hedge a haircut. Were looking for a neat buzz cut not a shaggy unkempt look. With a careful second cut we can safely carve this down a little bit further making the hedge tighter again still. This second cut is the stage that gives the hedge its clean crisp and professional look. Note: hedges should be trimmed at least once a year any time after July but before freeing temperatures. Leaving the hedges for a year will leave you with a less dense product when you are finished as the plants production goes to its leaders rather than its side. 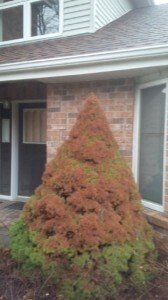 Talk to Georgina Garden Centre about best practices if you desire to change the shape of your hedge. Use string lines when setting the initial shape of the hedge to ensure its lines are straight and linear. This entry was posted in to do, Uncategorized and tagged fall maintenance, georgina, georgina garden centre, hedge, hedge trimming, how to, keswick, landscape, outdoors, planting, privacy, pruning, to do, trimming on September 15, 2017 by Online Graphics.